Charlie Appleby’s charge hails from the family of Group One winner Dilshaan and Listed performer Darrfonah, so there is clearly more than a hint of ability on the pedigree side. Festive Fare did not run as a juvenile but sent for a Lingfield maiden last month, the 150,000 guineas Teofilo colt was well supported to make a winning debut. However, his supporters must have thought their money was lost as Festive Fare showed his inexperience by running wide throughout and failing to handle the home turn at all. He found an extra gear when the field straightened up though and while he only won by a head, he was surely good value for the margin given the route he took. Festive Fare starts life in this sphere off a mark of 84 and while that perch leaves him well short of justifying his Investec Derby entry just yet, he looks the type who can make plenty of progress in due course. The Third Man can give trainer Henry Spiller a first success in the 32Red.com Handicap. Doncaster: 2.20 Gold Present, 2.55 John Constable, 3.25 Oscar Time, 3.55 Racing Europe, 4.25 Paint The Clouds, 4.55 One More Go. Ludlow: 2.10 Dan Emmett, 2.45 Royal Redemption, 3.15 Roll The Dice, 3.45 Henri De Boistron, 4.15 Qasser, 4.45 Twirling Magnet, 5.15 Mighty Missile. 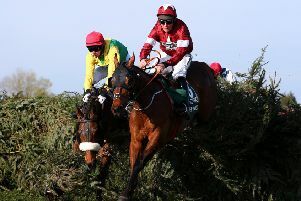 Punchestown: 2.05 Merry Westerner, 2.35 Boris De Blae, 3.10 Analifet, 3.40 Mr Eko, 4.10 Easter In Paris, 4.40 Oscar Sam, 5.10 Jett. Kempton: 5.40 Pearl Noir, 6.10 The Third Man, 6.40 Par Three, 7.10 Triple Chocolate, 7.40 FESTIVE FARE (NAP), 8.10 Katmai River. Lingfield: 2.00 Tarooq, 2.30 Boboli Gardens, 3.05 Steady Major, 3.35 Toast Of Newbury, 4.05 Coursing, 4.35 Darrell Rivers, 5.05 Elle Shade. Double: Festive Fare and John Constable.